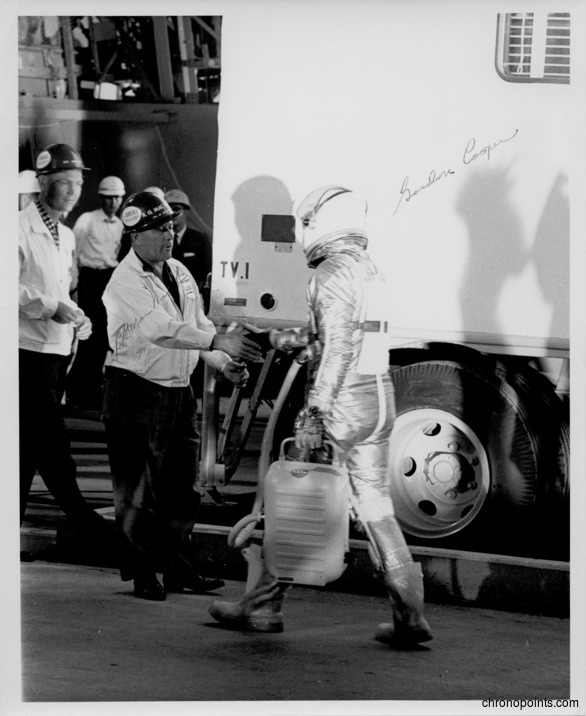 B. G. MacNabb, General Dynamics/Astronautics director of operations, greeting Mercury 7 astronaut Gordon Cooper (1927-2004) during a practice, the day before a launch was scrubbed or launch day at the launchpad at the Cape Canaveral Air Force Station Launch Complex 14. Cooper, walking in his air conditioned space suit, was scheduled to embark on his 22.5-orbit mission. This photograph was also signed by Cooper. “B. 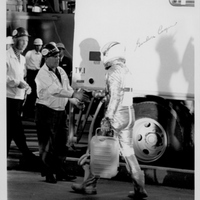 G. MacNabb with Astronaut Gordon Cooper.” RICHES of Central Florida accessed April 24, 2019, https://richesmi.cah.ucf.edu/omeka/items/show/4996.